The two main collection system trunk sewers merge at the wastewater treatment plant in Waldwick. 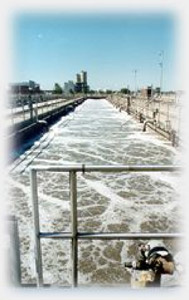 Before further processing, the wastewater entering the plant is screened to remove rags, glass, rocks, and other large debris. Screening is performed in two separate screening chambers that may be operated independently. The screens consist of vertical steel bars spaced to catch debris of a certain size. Mechanized rakes continuously scrape the screens to remove the debris and deposit the material into hoppers that press the liquid from the material. The screenings are then disposed of as a solid waste. The quantity of screenings increases dramatically during wet weather induced high flows. The screening performed prior to this step of the process is intended to remove materials that could damage equipment and impair the downstream processes. Primary settling represents the first step of treatment intended to abate water pollution. Primary settling is merely a physical separation of solids from the wastewater. The wastewater flows into the primary settling tanks where the flow velocity is reduced and the suspended material is allowed to settle to the bottom of the tanks. Approximately 50% of the suspended solids and Biological Oxygen Demand (BOD) are removed in this unit process. The settled material, referred to as primary sludge, is pushed by automatic sludge collection equipment into a hopper from which the sludge is pumped to the grit collectors. The facility has four (4) primary sedimentation tanks. As part of the primary treatment, floatable materials such as oil and grease that rise to the surface of the tanks are skimmed and commingled with screenings and grit for removal to a landfill. The bulk of the liquid then flows by gravity to the activated sludge aeration tanks. Grit consists of sandy materials and other particulates that readily settle from the wastewater. Although some grit may be discharged to the sewer system by users, most grit is washed into the system along with groundwater infiltration. Since grit is inorganic, it cannot be removed in the biological treatment processes. If it is not removed prior to biological treatment, it accumulates in the process units, and tends to cause excessive wear on the equipment. Sludge collected at the bottom of the primary settling tanks is pumped to the grit removal system where the grit is removed in a hydrocyclone. Heavier grit and suspended solids collect on the sides and bottom of the cyclone due to induced centrifugal forces, while scum and lighter solids are removed from the center through the top of the cyclone. Grit is collected and disposed of offsite. The degritted lighter solids in the slurry are pumped to the sludge thickeners. Because of the high BOD loads that remain in the wastewater following primary treatment, further treatment must be provided before the effluent may be discharged. 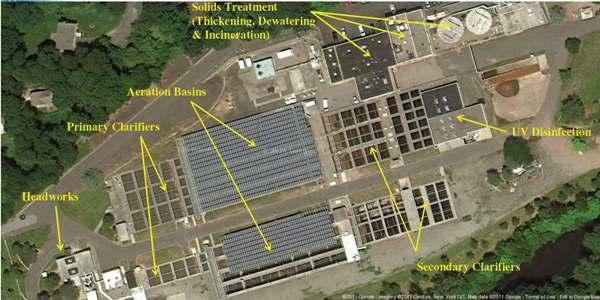 The NBCUA employs a biological treatment system known as the activated sludge process to achieve secondary treatment. During this process, the wastewater flows into aerated and agitated tanks containing a complex mixture of bacteria, fungi, protozoans, and other microorganisms that are referred to collectively as the biomass. The dissolved and suspended organic matter in the wastewater serves as a food source for the biomass that the organisms use to grow and reproduce. Sufficient air must be provided to supply the biomass with the oxygen necessary for respiration. If too little air is introduced into the aeration tanks, the biomass will use anaerobic respiration to metabolize the organic matter, producing foul odors and poor effluent quality. The facility has five (5) aeration tanks. After the wastewater and biomass have been aerated for a sufficient period to allow the soluble BOD to be incorporated into the cells of the biomass, the mixture flows to the final, or secondary settling tanks. Since these tanks are not aerated or agitated, the biomass is allowed to settle. The remaining effluent, which by this point in the process appears quite clear, is ready to be disinfected and discharged. The settled biomass is either returned to the aeration tanks or wasted. Wasting the biomass, which is now designated as secondary sludge, refers to the removal of this material from the treatment process for final disposal. The wasted secondary sludge is pumped to the gravity thickener tanks. Liquid overflow from the gravity thickeners is returned to the inlet of the plant. Primary and secondary sludge settled in the gravity thickener(s) is pumped to one of two belt filter presses for further dewatering. The dewatered sludge is sent to the fluid bed incinerator where combustion at greater than 1500 ºF destroys all organic material. Samples of the sludge are analyzed and reported to NJDEP. An inert residual ash discharged from the incinerator is dewatered on the ash pad and trucked to a landfill. The overflow stream from the final clarifiers flows by gravity to the UV disinfection system. 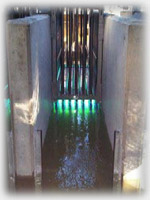 Here the wastewater flowing through open channels is exposed to ultraviolet light produced by lamps suspended in the channels. This treatment destroys any microorganisms without the addition of chlorine to the stream. The original design featured four (4) open channels to disinfect the wastewater stream. The system has been upgraded to a more modern design requiring only a single open channel to disinfect plant wastewater.